Indonesia used to be a Dutch colony, and Indonesian food still plays a major role in the Dutch food culture. One of the most common Indonesian foods is “saté”, grilled marinated skewers of chicken or pork served with a peanut sauce that is referred to as “satésaus”. This sauce is even served with french fries (“patatje oorlog”, also with mayonnaise) and other snacks. 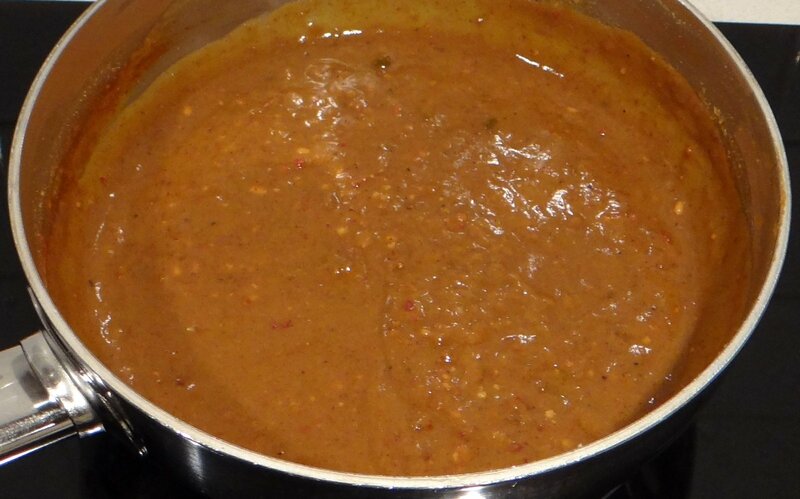 Home-made peanut sauce has a more interesting taste and you can make adapt it to your own preference. Most satésaus is store-bought, but apart from finding the right ingredients it isn’t hard to make by yourself from scratch. I cheated a little and used store-bought peanut butter rather than making that from scratch as well (from peanuts). 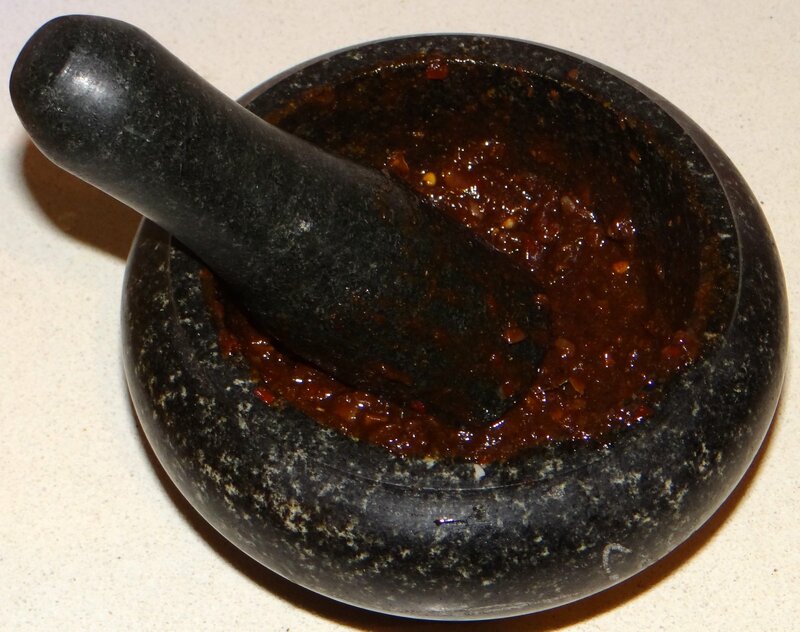 Put the shallots, garlic, chile peppers or sambal, trassi, laos, tamarind, sugar, salt, and lemon leaves in a pestle. 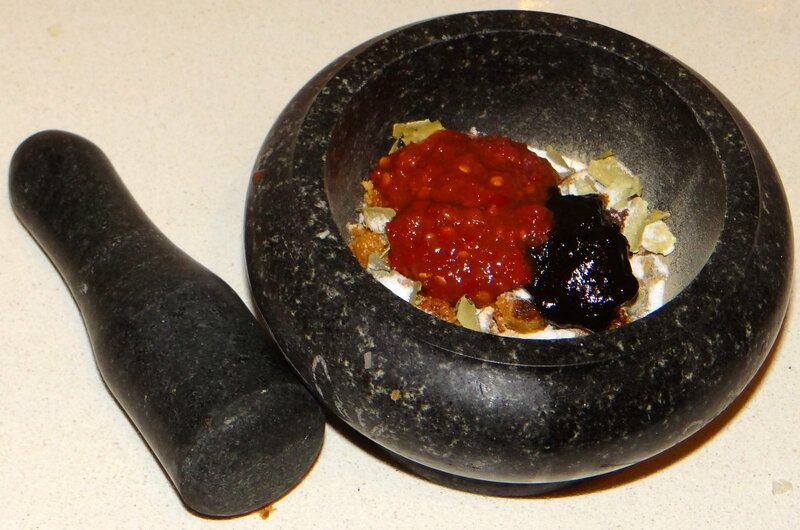 Use pestle and mortar to grind into a pulp. Add 200 ml (5/6 cup) cold water. 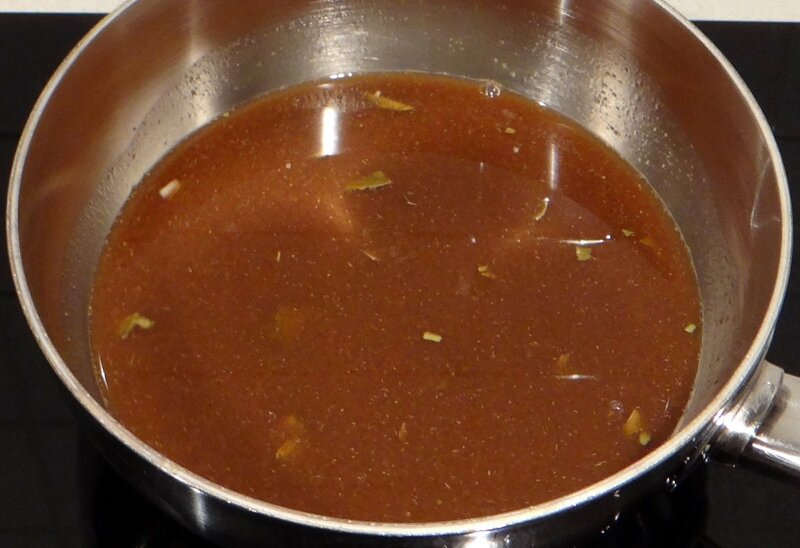 Bring to a boil and cook for 1 minute, stirring. Lower the heat. Add peanutbutter and creamed coconut and simmer, stirring, until both have completely dissolved. 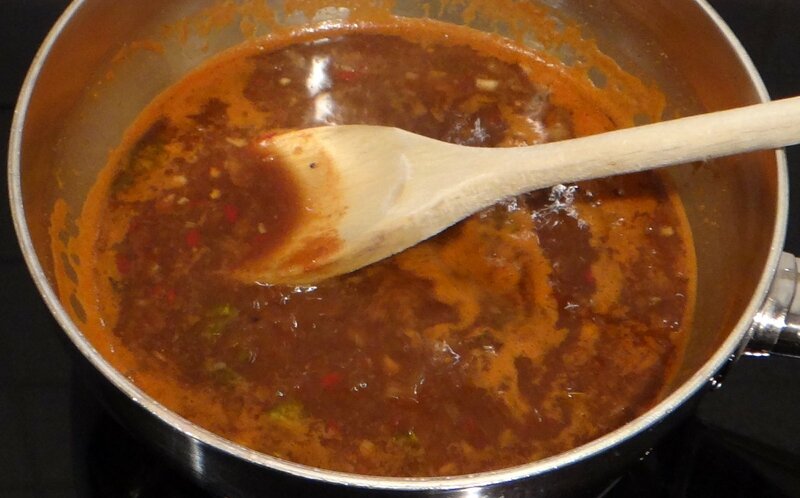 Taste the sauce and add more of any of the ingredients to adjust it to your preference. 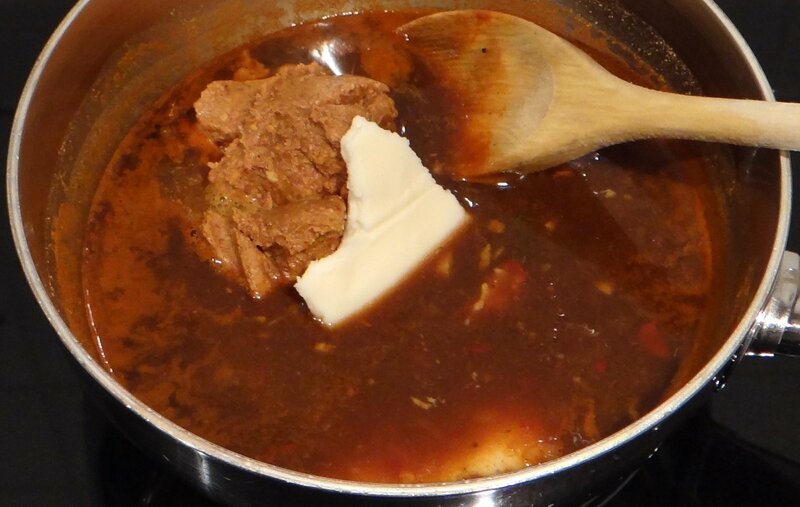 If the sauce is too thick and/or too strong, you can dilute it with a bit of milk or water. I reckon that must be very tasty. It puts me in mind of a long ago trip to Amsterdam with the Wife. We had ricetaffle (pardon the spelling). You would impress if you did a post on that! Rijsttafel is a Dutch colonial invention. The dishes it consists of are all Indonesian, but the way of serving all the different dishes at the same time was something my ancestors wanted to impress their guests. I don’t think I’ll be making a rijsttafel any time soon, but perhaps at some point in the future since I have started to experiment more with Asian cuisine. This is a much more complex sauce than I’d anticipated. There are a number of Asian markets in this area, although I don’t know whether they have Indonesian ingredients. Well, tis the season for scavenger hunts. It would be interesting to see just how many of these ingredients are available here. It is the complexity that makes it interesting. I think all of the ingredients are not just Indonesian but more general to South-East Asia, but I don’t have a clue if they are available in the USA. 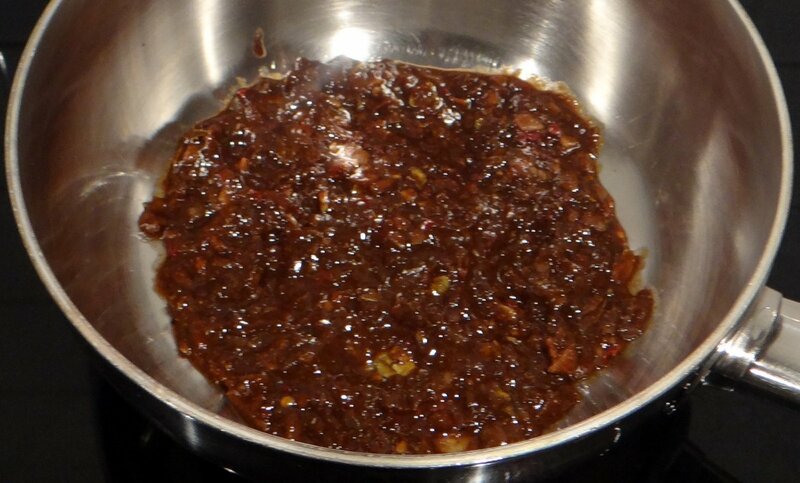 The fermented shrimp powder smells horrible, but it gives a great depth to the sauce. The powder is actually ground from blocks of shrimp paste, so you might encounter it in that shape. It’s always amazing how many of the Asian food items smell awful but add great flavor, Fish Sauce comes to mind as another. It makes me wonder what prompted someone to eat it. 😮 The fermented shrimp paste with which I am familiar is a paste, not a block. I will have to go see what I can find. I always enjoy shopping at the Asian markets. Most recipes from South-East Asian are from long before refrigerators were introduced into the region. The famous beef rendang (which I might try to make for the first time sometimes this winter) can be kept for a month at room temperature after it has been cooked. Originally, terasi was made by burying the shrimp under ground and then retrieving the fermented shrimp again months later… Sounds delicious, doesn’t it? As it looks tricky with some of the ingredients I may have to use this as an inspiration for a peanut sauce. It looks really good though I will check first to see if I can find this stuff! I’m sure it will still be good if you leave out or substitute some of the ingredients. Would love to hear how it turns out! Sometimes disasters can be both fun and interesting to write about 🙂 But I don’t always blog about them either.